and Tea Rooms on our online listing. At Antiquing We Go we like to follow the roads less traveled. Not only do we list antique shops on main the roads, but we also take you to those hard to find shops on the backroads. Many states are known for a specific attraction, unfortunately many times the mom and pop stores are left out. We love to support the mom and pop stores. That is why, unlike other marketing products we follow those roads less traveled. Goal: We aim to uniquely brand our online directory listing as the ‘go to’ advertising publication that delivers results for those who advertise with us. Antique shops and businesses in our listing will benefit from a remarkable increase in loyal and repeat customers. Vision: Our vision is to make the shops in our listing easy to find for potential collectors of Antiques. With detailed information about each shop, what they offer and where they are located. Objective: To provide accurate information on each shops listing and inform clients of upcoming events. Customers will have needed information such as days and hours, contact information, and pictures of their shop. Want to be a part of our elite list of Antique Shops that are generating new clients? Simply go ahead and fill the form below now. 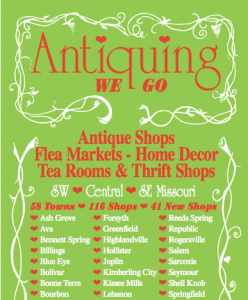 Why advertise on Antiquing We Go? We live in a digital world that is greatly influenced by the internet. Businesses that advertise online stand to gain the most from rapid growth and a limitless supply of customers. While businesses that fail to take advantage of the benefits of online marketing wither away and die. Recent studies show that the majority of users (antique buyers) rely on Google and online business directories to find what they want. Creating awareness for your Antique shops is critical to the success of your business. And this is where the “Antiquing We Go” online directory listing, steps in to save the day. When you advertise your business on our online listing, you open your business to a whole new world. The “Antiquing We Go” online directory exposes your business to limitless growth potential, and new ‘buying’ clients for your store. Your business information will be accessible to prospective clients who might not know that you existed in the first place. Joining our elite community is a no-brainer. Fill the form to give your business the leading edge today! Customers will get accurate and complete information about your business from a reputable and reliable source. This will help in making quicker buying decisions and convert more prospects for your antique shops. We do the heavy lifting and bring your customers to you. Clients will be given accurate directions to your store’s door. Our listing brings you the most interested customers; giving you the chance to convert more. Our online directory listing allows for full customization. You can manage your pictures and content to show your customers the best features of your store. You can display the finest items in your store and show prospective customers/collectors what to expect. You can easily update your business information to reflect changes such as opening and closing times. You can advertise special sales and events that showcase what you offer and also generate added interest in your store. Each store pays a fee to advertise on the listing. Be sure to let them know you found their store through us.